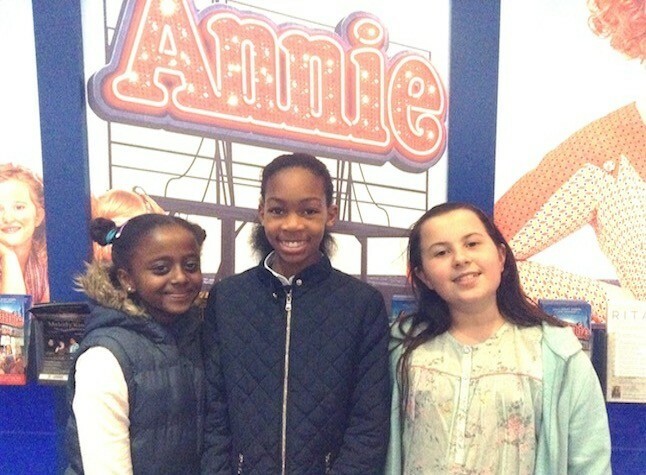 The sun came out today when I experienced the amazing Annie The Musical on stage at The Fairfield Halls – wow what a show! I know the story of Annie is one that most of us kids and families enjoy from a really young age. I was singing songs from the musical before I even knew where they originated from and only a couple of years back Cameron Diaz played a really super Miss Hannigan in a new Hollywood version of the classic tale. My friends and I LOVED that movie, it’s a great DVD to watch when you’re having a sleepover because it lasts for ages and everyone can join in the songs. I reckon our school playground has heard more versions of ‘Tomorrow’ than any other song written. 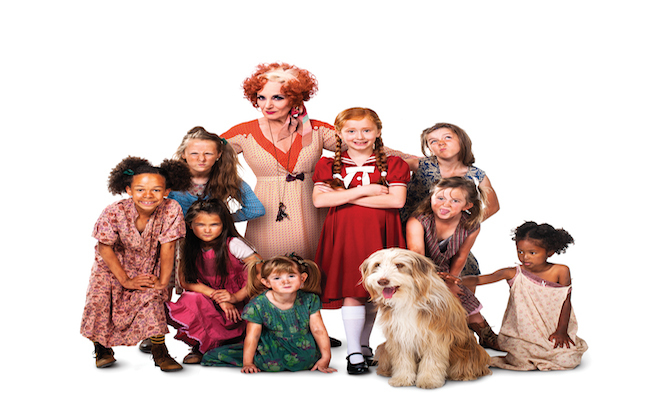 So this new ‘Annie The Musical’ has big boots to fill, how would it ever be as good or as thrilling as the years of Annie enjoyment we’ve all had so far – a challenge I thought. However boy was I surprised to find that this stage version was better than any Annie production that I’d ever seen before. The UK tour is whizzing around the UK this Spring so that everyone gets a chance to see it. 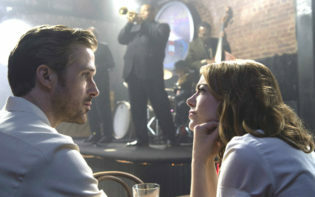 I was lucky enough to catch it with my friends, Alysia and Chiara at Croydon’s Fairfield Halls. Star of stage and screen, Lesley Joseph (who we all know as Dorian from the TV show Birds of A Feather) played the powerful and sneaky, Miss Hannigan. 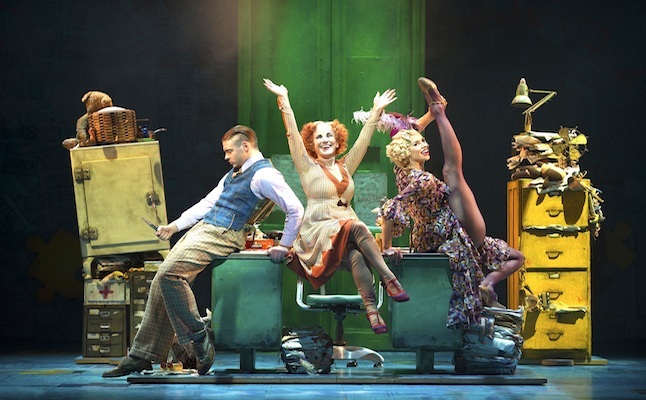 I know that in the past we’ve always known her to play funny comedy roles, however you get to see just how good an actress she really is when she’s stomping around the stage as bossy Miss Hannigan. Set in 1930s New York, brave young Annie shows us how hope and determination shine out above everything else whilst she’s living in the orphanage under Miss Hannigan’s watchful eye. With a steely resolve to find her real parents, her luck changes when she is chosen to spend Christmas at the residence of famous billionaire, Oliver Warbucks. Cunning Miss Hannigan has other ideas and hatches a plan to throw Annie’s search off course. I’m sure you all might know the story well, however if you need to watch it I will keep it a secret for you to experience this wonderful show for yourself. Loyal Annie fans will be delighted as the show includes all of your musical favourites, from the unforgettable Hard Knock Life and Easy Street, right through to Tomorrow. I far from think I’ve ever sung so loud or so happily as my fantastic time in the audience watching this musical. I also have to give a massive hi-five to the amazing children who formed the cast of this show especially Elise Blake who stole the limelight of the star role of Annie. Elise, you’re a superstar – you’re singing is awesome, you’re on stage charisma is amazing and even Sandy the dog loved you! If you had one dollar left in this big wide world, I’d say you should bet that bottom dollar on a ticket to Annie the Musical. It’d be the best money ever spent. 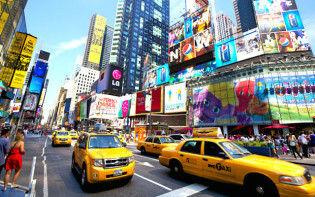 You’ve gotta see it! And if you can manage to grab the show whilst it’s still playing at The Fairfield Halls, then that’d be even better still. The famous theatre only has a few weeks left until it closes its doors for a 2-year overhaul, so if you may experience The Fairfield Halls whilst it’s still in its original state, then you’ll be tasting a slice of delicious history! Tickets are available from the Fairfield Halls Box Office 020 8688 9291 or www.fairfield.co.uk priced £25.00 – £47.50.